It Suits the Purpose - The Chip's Challenge Wiki - The Chip's Challenge Database that anyone can edit! It Suits the Purpose is the 52nd level in Chip's Challenge Level Pack 4. It was created by Zane Kuecks. Its design is based off the four suits from a standard deck of playing cards. Pick up the chip to the west of the starting point and head north, collecting chips as you work your way toward the first block. Slide the block over the brown button, then proceed east through the trap. 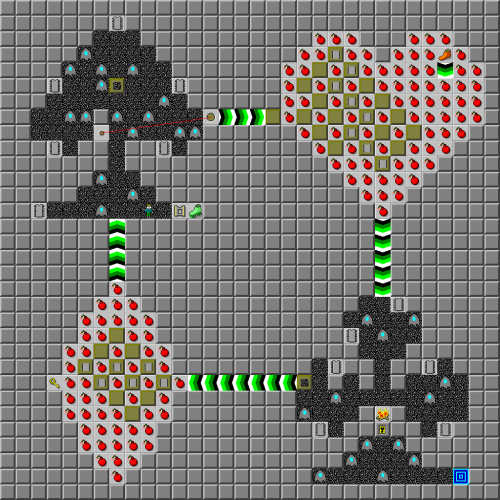 In the heart-shaped room, push blocks into bombs to build a path both to the exit in the bottom of the room and the force floor in the northeast corner of the room. You will not be able to pick up the fire boots yet, but make sure you pick up eight chips in this room before continuing south. The the club-shaped room, pick up all the accessible chips and head to the west room. Again, push blocks into bombs to build a path over to the yellow key and north to the exit. As long as you have picked up all the chips, you can now head north back to the starting point, go through the socket and collect the suction boots. Go back to the heart-shaped room in reverse order and collect the fire boots, then head south through the fire and yellow lock then finally exit to the east.